The weather seamed to have gone crazy and reports on TV look a bit like the film ‘The Day After Tomorrow’. Here in the UK we have been waking up at night to the sound or rain trickling on the roof and the whistles of wind blowing in our window. No snow yet. More dedicated bloggers than me dedicated their end of year posts to summarising and listing 10 of the best… But I’m afraid I just cook and post. I enjoy other’s dedication to photography, styling and creative writing. Out New Year resolution is to stick to the SCD diet strictly, and hope that this will increase energy levels and decrease the chances of that horrid illness returning to haunt our lives. Lots of will power and creativity required. There are so many recipes and information out there (like roost, SCD recipe and Hold The bread, Please) but sometimes I like to look at my baking drawer and see what I can come up with. This time cocoa butter, vanilla and cherries (unseasonal but reduced price in the supermarket) popped at me. Het the oven to 160˚c and line a muffin tin with 12 muffin or cupcake liners (I used a silicone muffin tray so didn’t use paper liners). 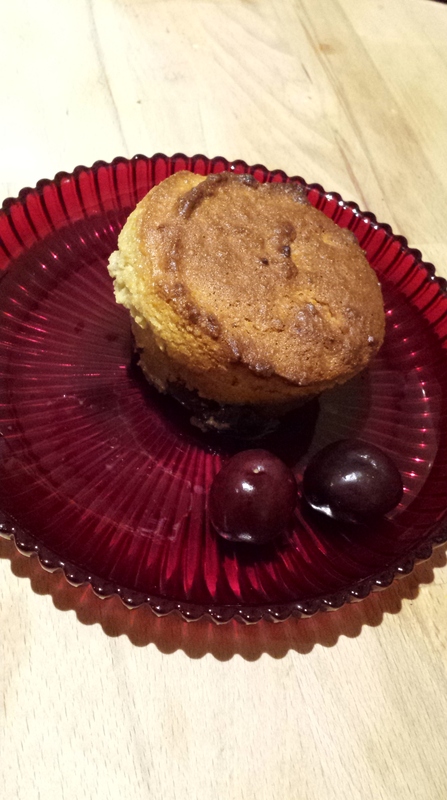 In a small bowl, mix the pitted cherries with 1tbsp honey and some of the vanilla beans (if using), then scatter a few cherry halves on the bottom of each lined muffin cup. Melt the coconut oil and cocoa butter in a small pot on a low heat, then remove form the heat and add the 1/2 cup honey. Whisk the eggs and mix them into the other wet ingredients. Add the rest of the vanilla if using. Mix wet ingredients into dry until incorporated and pour the batter into each cup, covering the cherries.